Sometimes a very simple thing can help make life a bit easier. I find a well-placed dot has the potential to make my daily activities more efficient. Below is just one example. The two vials below are the same shape and size and I use them every day to distribute vitamins for my wife and myself. By looking at the tops of the containers, it is easy to see which is which. BTW, I also have a dot on the bottom of the pill container that has the dot on the top. In that way, I make sure the tops and bottoms stay together to avoid any cross-contamination of medications and vitamins. Of course the mark doesn’t have to be a dot. 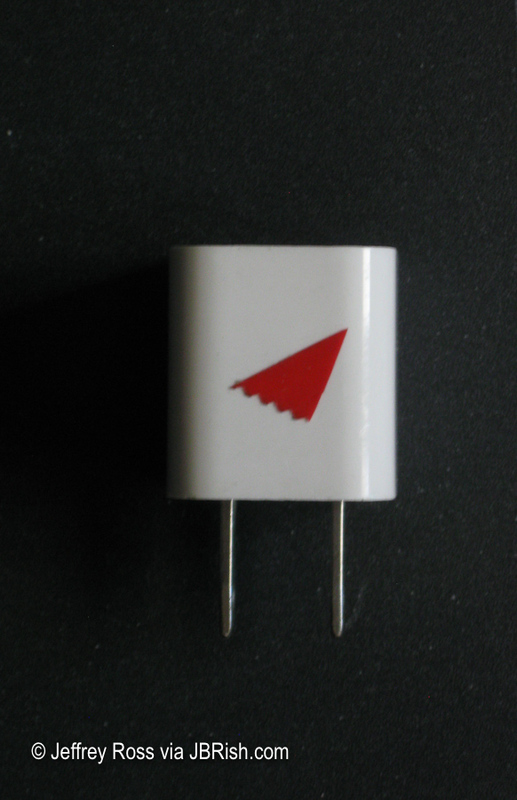 It can be a small triangle or any tag. Any marking that helps the user decide between two choices can be helfpul. 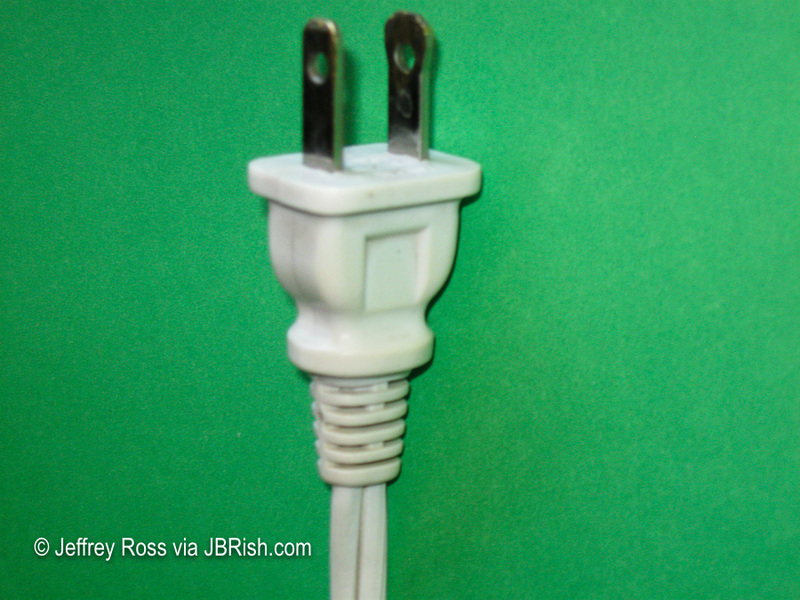 Take this plug for example. 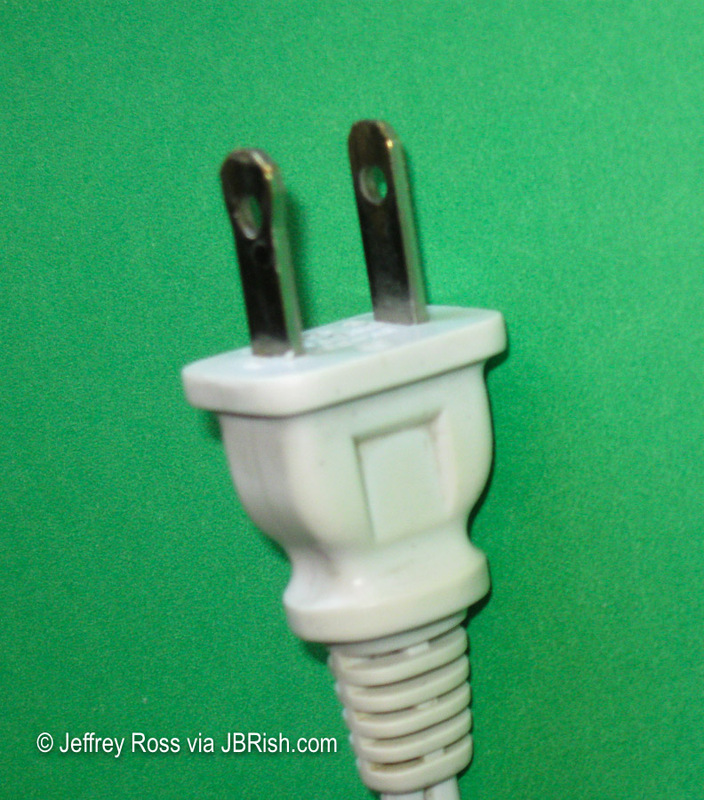 Notice that the larger, wider prong (neutral) is on the right. And there is no marking on the plug itself. 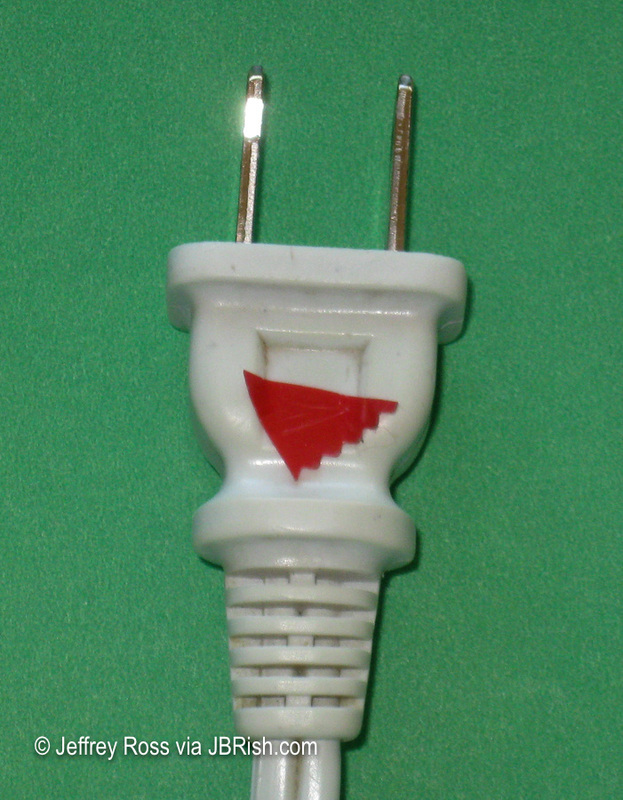 For the record, here is the other side of the same plug, this time with the wider prong on left to show the other side of the plug. I use a hot water kettle almost every morning and when I am in the middle of my morning regimen, sometimes without my glasses on, having a mark on the side of the plug that should be up when plugging the kettle into the outlet saves me time and helps expedite my routine. It doesn’t have to be pretty (which is a good thing), just functional. Take this legacy iPad USB connector that I still use with my aged device. The USB connector on the left needs to be aligned just right with the wall plug adapter. 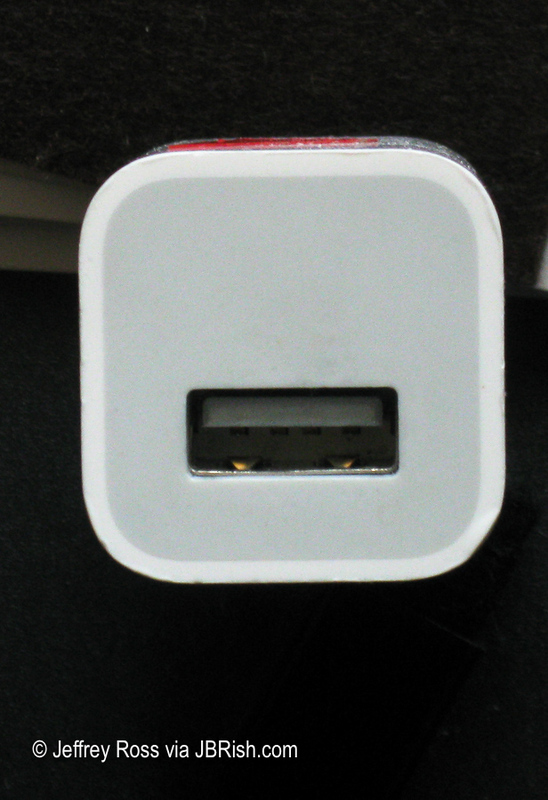 Like any USB plug-connector, there is a part that is open and a part that is blocked. Notice the upper, light (white) piece of plastic on top. 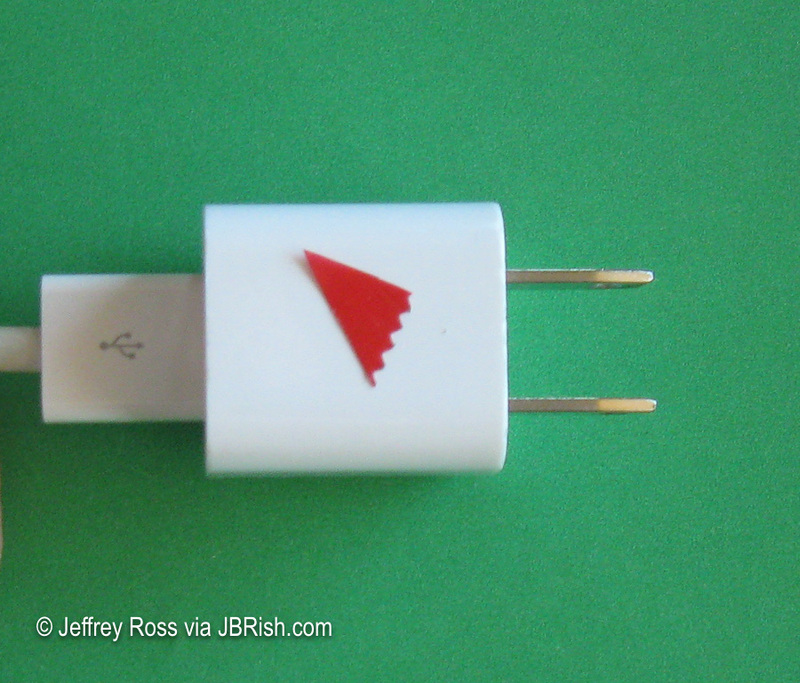 I placed a red triangle on the top part of the plug. 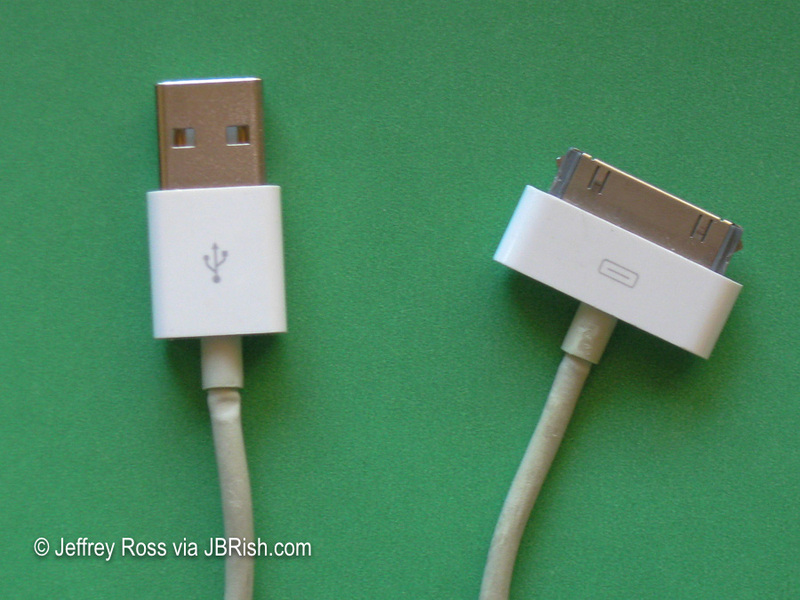 The USB cord is now much easier to match up when connecting. 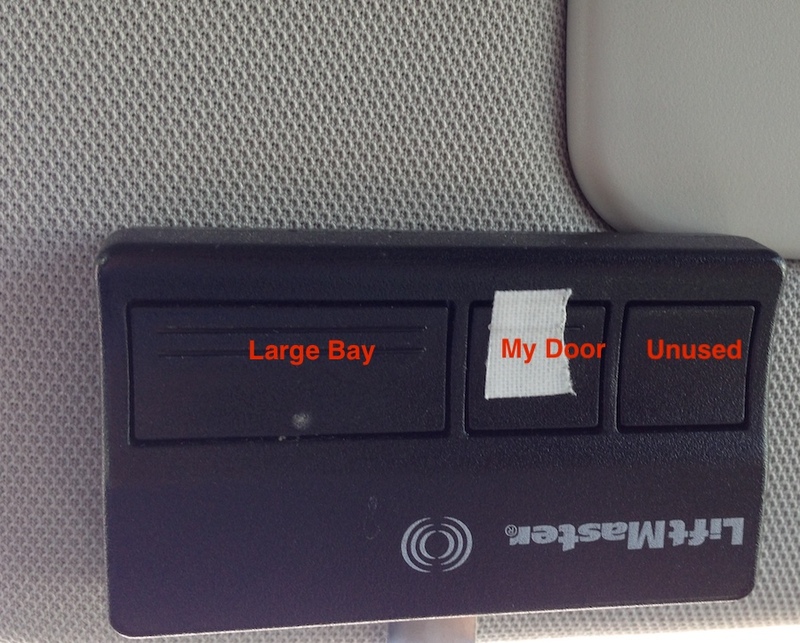 When driving home at night, I use my remote garage door opener as I am approaching and if it is dark, it is not always easy to locate the button for my car’s bay. A white piece of tape on the remote, helps me find the correct button. Do you have use for a dot, triangle or other mark to ease or expedite your routines? NOTE – Before anyone else beats me to it, I will be the first to admit that this is not earth-shaking news and perhaps many JBRish readers have already figured this out. If you have other unique, useful marking solutions, why not leave it in a comment below! Did you ever visit a friend’s house and find that they use something in a unique or creative way? Or perhaps you see something demonstrated online showing how something considered trash can be turned into a useful tool. I think everyone likes to learn about Lifehacks and how to use things creatively. I haven’t shared one in quite a while so I hope you find this technique interesting if not useful. The lifehack below is a Youtube video explaining how to secure a bandaid to a finger tip to prevent it from coming loose very easily. I think many of us have had this problem and will find this an interesting solution. Did you ever visit a friend’s house and find that they use something in a unique or creative way? Or perhaps you see something demonstrated online showing how an item considered trash can be turned into a useful tool. I think everyone likes to learn about Lifehacks and how to use things creatively. I use and/or have developed a number of Lifehacks. I haven’t shared one in quite a while so I hope you find these interesting, if not useful. Many of our “bottles” and jars are now made from recyclable plastic, but most ot their lids, however, are not recyclable. We save some of the lids in a variety of sizes and repurpose them for alternative uses around the house. 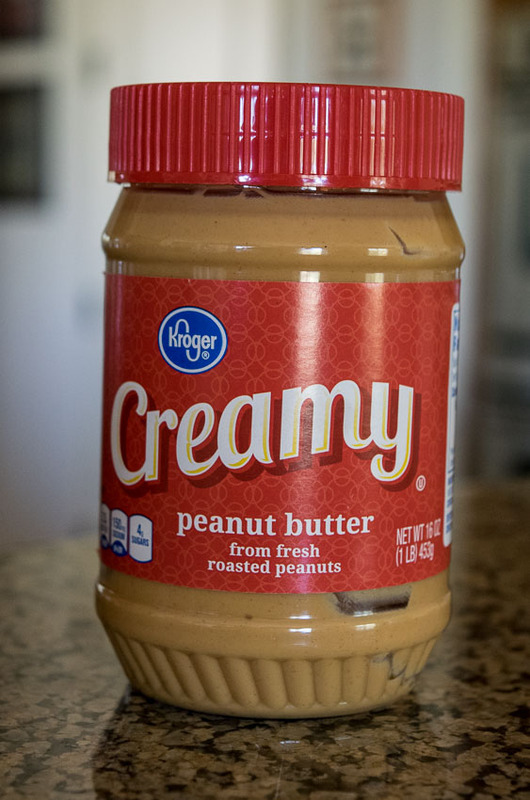 This peanut butter container, for example, has a sturdy red lid that is a nice size. 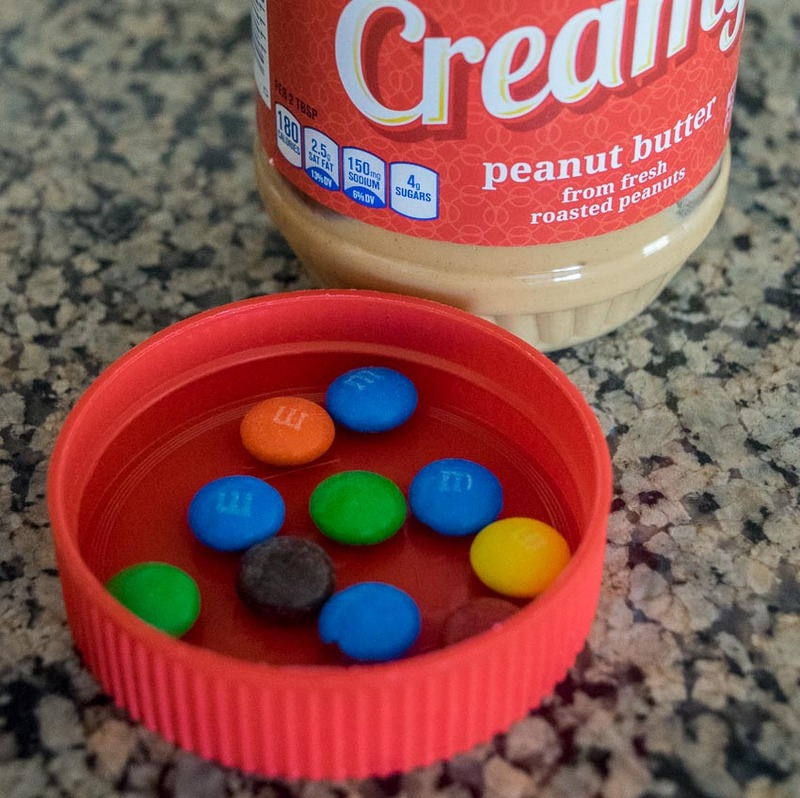 We use the lids as a snack dish of sorts to hold candies or nuts that we enjoy while watching Netflix. 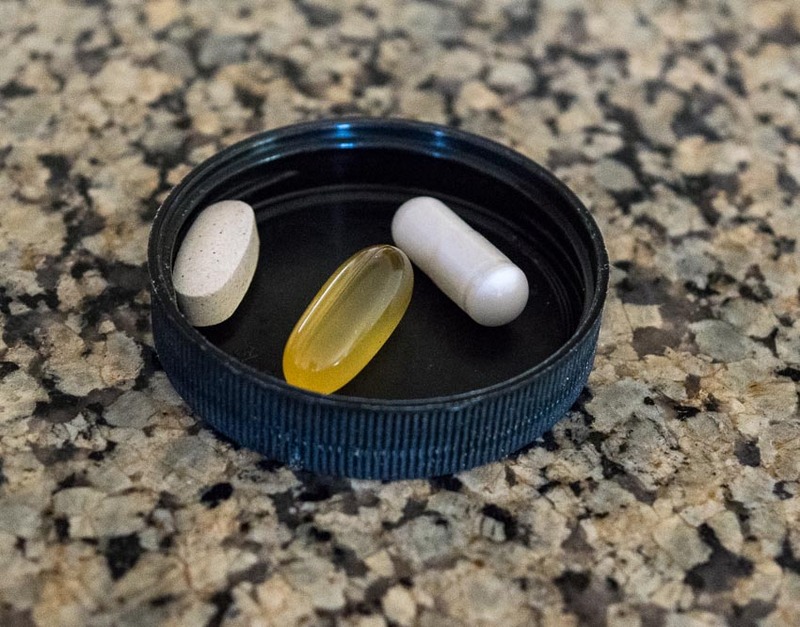 Some lids can be used to hold specialized small portions such as this lid-container holding three morning vitamins. Then there are times we have a partially filled bottle of wine in the refrigerator. 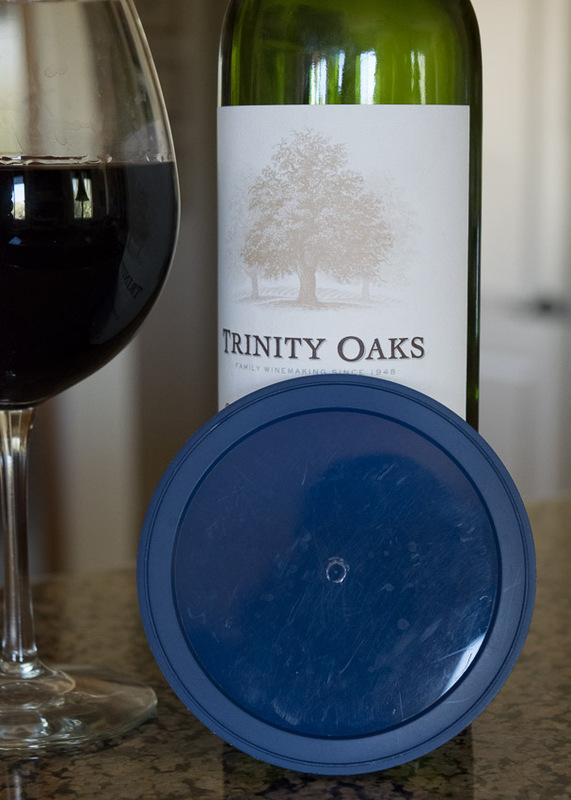 Since red wine is best serve at or near room temperature, we use lids from plastic containers to cover the wine while it warms. This particular lid was from a container of cheese crumbles. 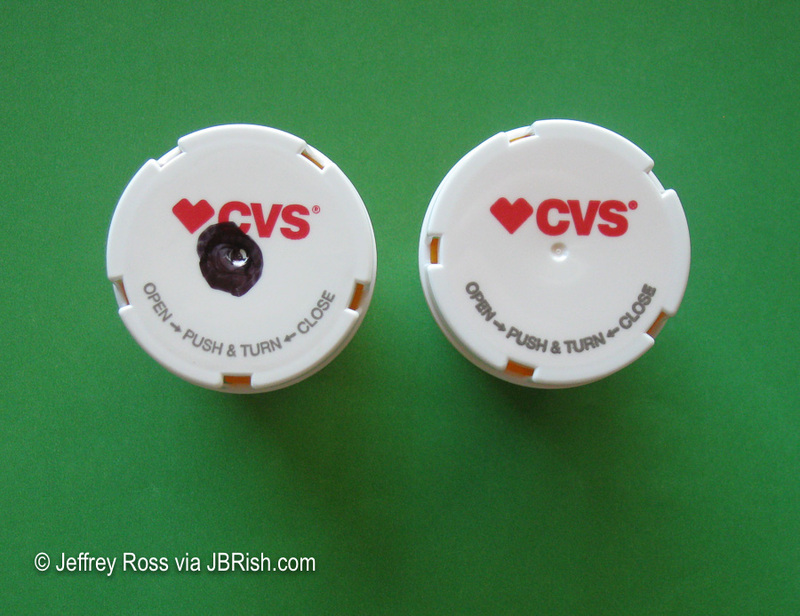 Do you use container lids in creative ways? Leave a comment below! JBRish.com originally published this post – ALL Photography Copyright by Jeffrey B. Ross, ALL Rights Reserved. Many parents will probably recognize this situation and the need for a resolution. 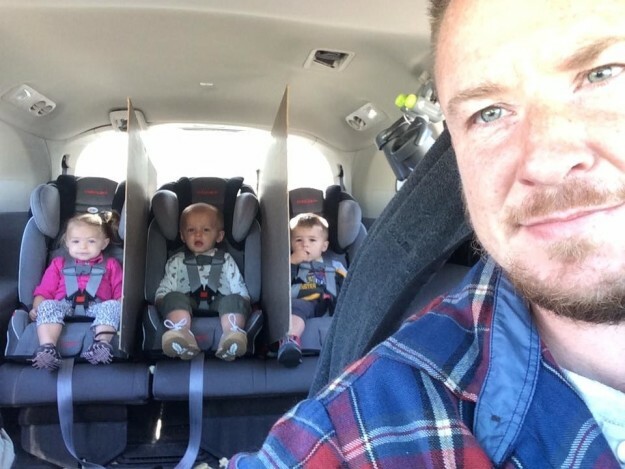 What would you do if you had triplets in the back seat of a car and they often got into a scuffle? Well, Jack White seems to have arrived at a solution some refer to as genius. What do you think? Or “repurpose it! !” The concept has been used for hundreds of years (think old cowboy boot nailed on a wooden post as a mail drop! )…but now the practice of using or changing an item for an alternate use has developed “urban cachet”. 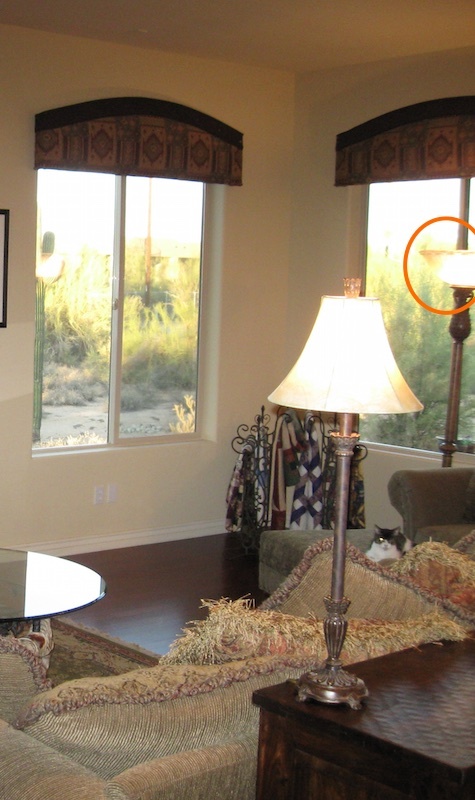 When the base of a floor lamp was unable to be safely stabilized, we knew it had to be discarded…but the large glass lampshade was perfectly fine. It was approximately 18” in diameter with fluted edges that (from afar and to a non-discriminating eye) looked a bit like marble or alabaster! A perfect planter! Several layers of plastic mesh (rain gutter lining) were placed over the two-inch opening at the base to facilitate drainage and keep the dirt (a modified cactus mix) from escaping through the bottom. 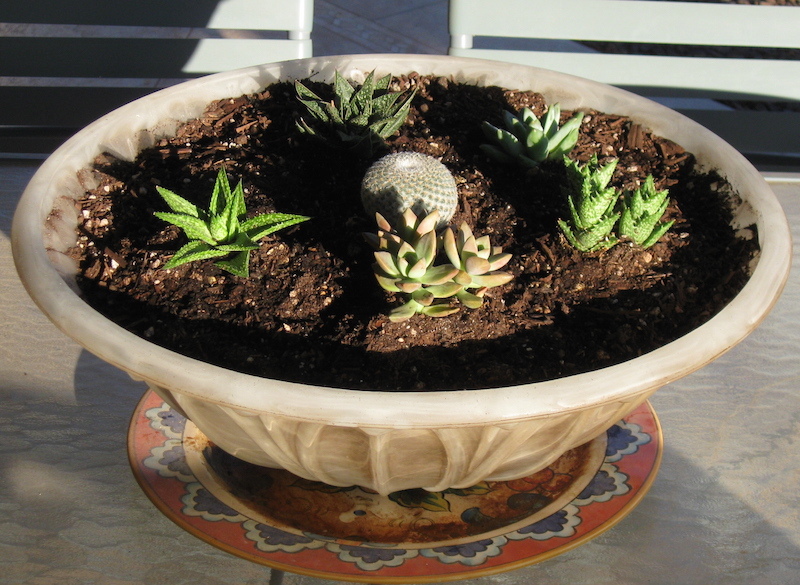 Small succulents (in 3-4” pots) from a local hardware store were carefully transplanted into the lampshade planter. 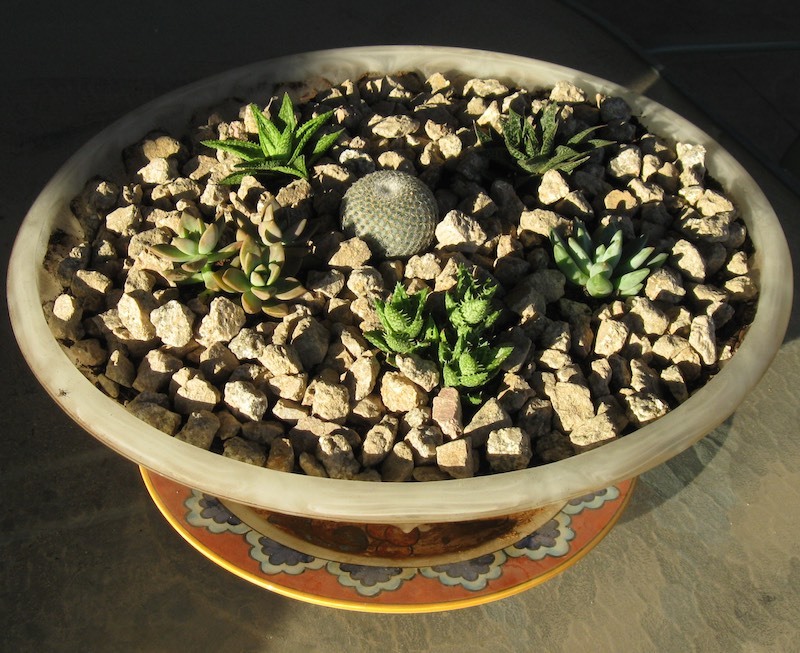 A rounded Mammillaria was chosen for the center and five other selections spaced evenly around the perimeter. These are all fairly slow growing plants with similar light and water needs. 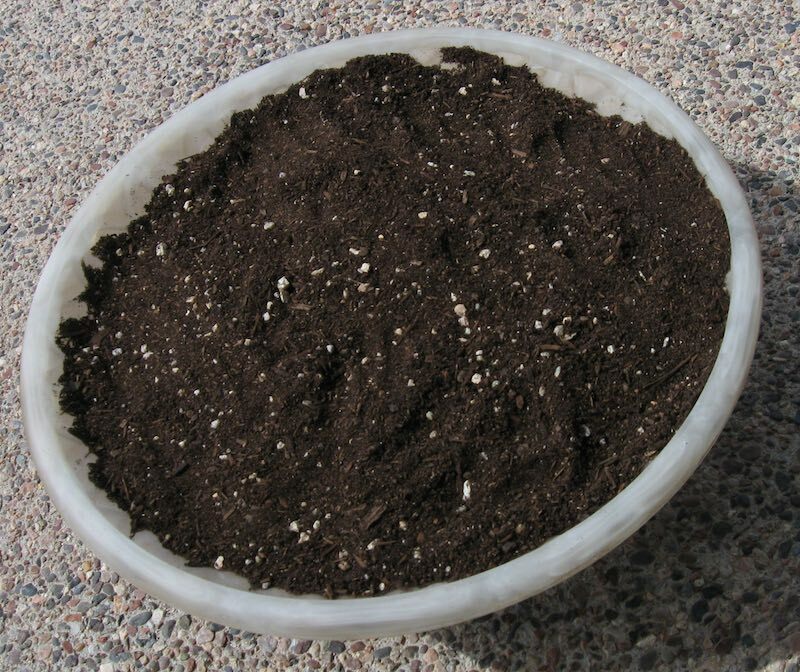 Light colored gravel was placed on top to serve as mulch and to add a decorative contrast. The planter sits on a table top beneath a covered patio and receives filtered light. Although the height makes it (hopefully) inaccessible to javelina; birds and squirrels remain potential adversaries. After six months, the plants appear healthy and show some (small) growth. The planter now happily lives within 10 feet of where it was once a lampshade!! Anyone who knows me is aware of the fact that I like my morning coffee. Let’s make that “love my morning coffee!” And if the truth be told, I have a lot of it. I don’t want to tell you how much, but trust me on this one; it’s a lot! Picture Courtesy of a screen shot from Starbucks video below. Anyway, my favorite brew is 100% Colombian coffee. Unfortunately when I am away from home, this commodity is hard to find so I then make sure to bring my Starbucks Via packets of the Colombian and lately I have been able to purchase it in larger quantities at COSTCO with a related savings. In the morning, I must confess, I use an automatic drip coffee machine (don’t stop reading yet) and over the years I have learned how to tweak it so I get a very good cup of coffee. It isn’t a great cup, but a very good cup. 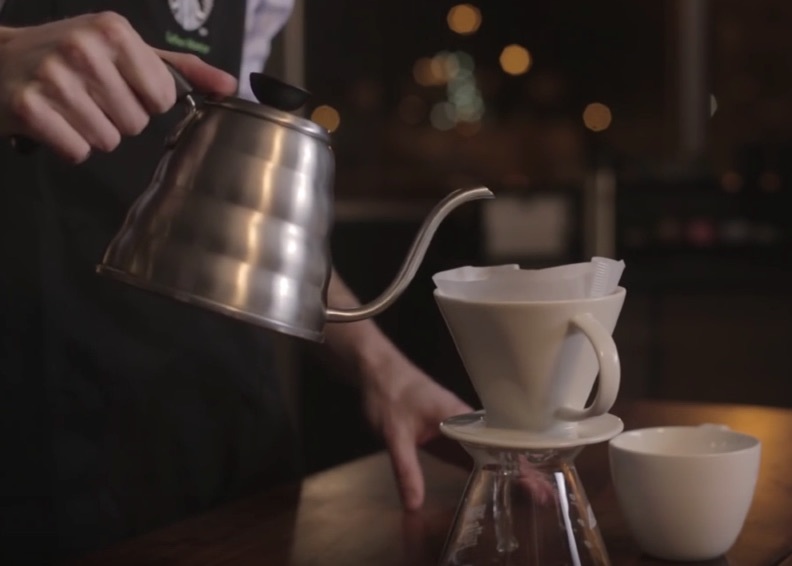 When I only want a single, somewhat smaller cup, I do use the pour over method similar to the one described in the videos below. A concept that may not be familiar to a number of people who like coffee, but have not read much about the brewing process is the bloom. In the video below, Sky Mountain Coffee explains this important aspect of the brewing process and what it can teach us. Thank you Sky Mountain Coffee! In the next video, Starbucks presents what they consider the best way to brew a single cup of excellent coffee using the pour over method which I use for a one cupper! Pre-wet the filter to get things warm and remove some of the paper taste! Get Rid of the water used in the “wetting step” mentioned above. Put the coffee in the filter; cone grind similar in texture to granulated sugar. Recommended amount of coffee – 2 Tablespoons for every six ounces of water. Water should be hot, but not quite boiling. I find it helpful to pre-heat the cup so that it is warm, not hot, and it does not cool the coffee as it is poured. You can do this by pouring some hot water in the cup and letting it stand a minute or so. Prior to the pour over, I let the water rest for twenty seconds or so after it has come to a good boil. I don’t want to scald the grounds. After letting the coffee bloom, I do not pour all of the water into the filter at once. Instead, I do the brewing using several pours so that the grounds have a chance to be thoroughly mixed by the water being poured. 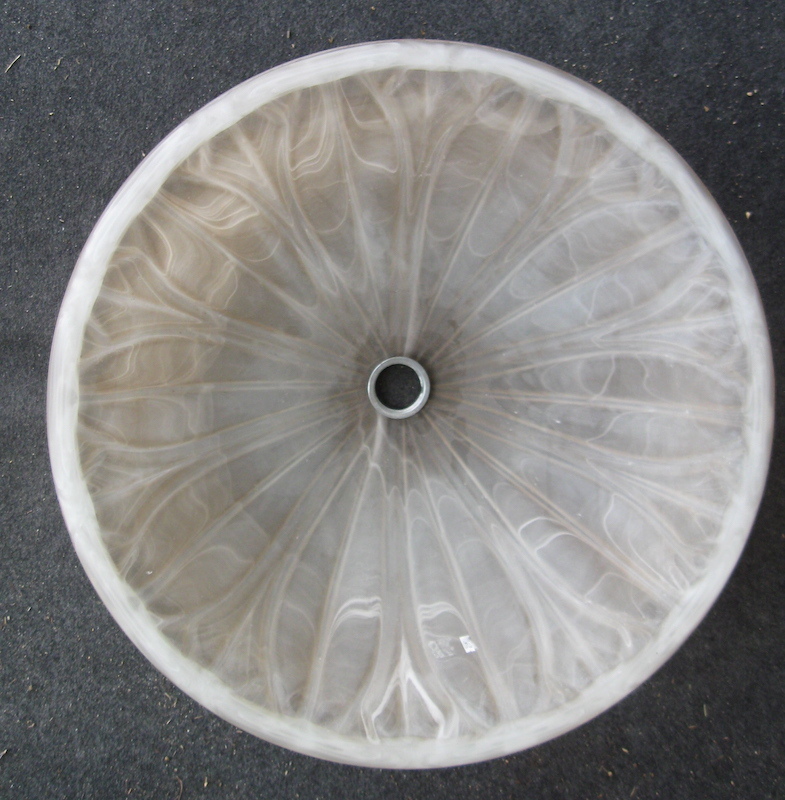 I pour the water in a slow concentric circle starting at the outside of the filter working my way to the middle. I believe this equalizes the exposure of the grounds to the water and thus extracts maximum flavor. I hope this helps you enjoy your morning Joe! NOTE – Full disclosure – Today is the first time I used this resource and I haven’t fully explored it, but it looks very useful. If you need a yearly or monthly calendar for 2016, let’s say, this website provides some nice options. I tried to get a calendar for 2030 and it seemed to work. The program allows the user to select the reference nation so that some of the holidays will appear accurate (as far as I can tell). 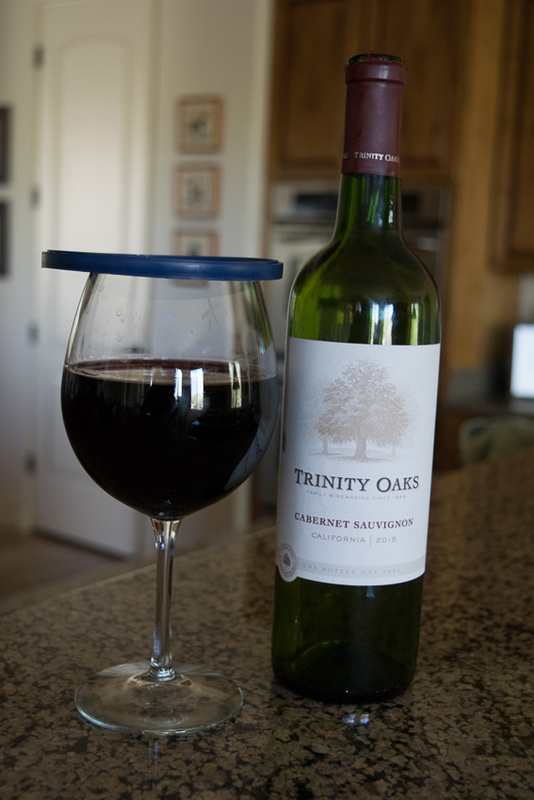 I really enjoy finding new ways to use household items to make life less frustrating and perhaps simpler. I have come up with a few of my own, but the Internet is full of them. The video below is one such resource. I was aware of a couple of the featured hacks, but not all! My one concern is that if soda can do all of these “wonderful things” to stains, drips and blobs, what is it doing to our stomachs? Years ago when my wife and I visited London, we found a camera on a train. Because the camera had a name and address on it, we were able to locate the owner and make appropriate return arrangements. In this digital era, it would make sense to account for such loss. I came across an idea that I thought was a good one and one that I might implement myself. If someone finds a camera, one of the first things they MIGHT do if they know anything about cameras, is to look at the pictures that are on the memory/data card in the camera. Every time the memory/data card is initialized for a new outing, etc,. why not take a picture of the following information that is printed neatly on a sheet of paper? In the event this camera is found please contact me. I do not advise including an address because if you are away from home, that might be able to be discerned from the other photos on the card and leave YOU more vulnerable. You might include a phone number if you think it is appropriate, but exercise caution. Do you use a camera that takes AA, AAA rechargeable batteries? Do you have trouble keeping track of which batteries are fully charged and which need to be recharged? I have developed a method that is simple and effective. 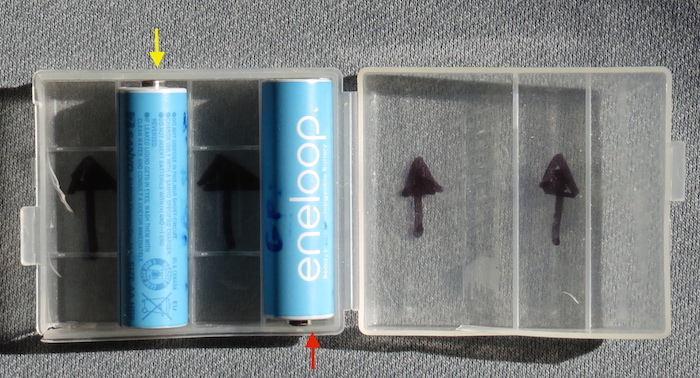 I use one of the plastic cases that generally comes with batteries if you purchase them online or via mail order. You can purchase these cases separately as well. Below is a picture of the case and you will notice that I have two arrows on the outside of the case. These are made with indelible marker. 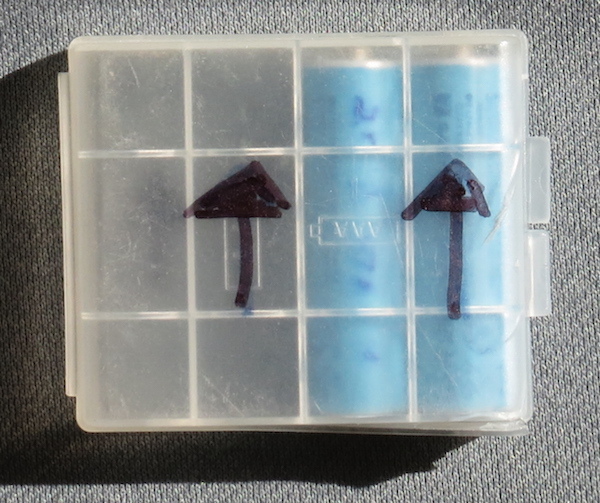 When the plus terminals of the batteries are facing in the same direction as the arrow, the batteries are charged. When a battery is used up, the terminal goes down. Thus the in the picture below, the battery with the yellow arrow is still charged while the battery with the red arrow needs charging. 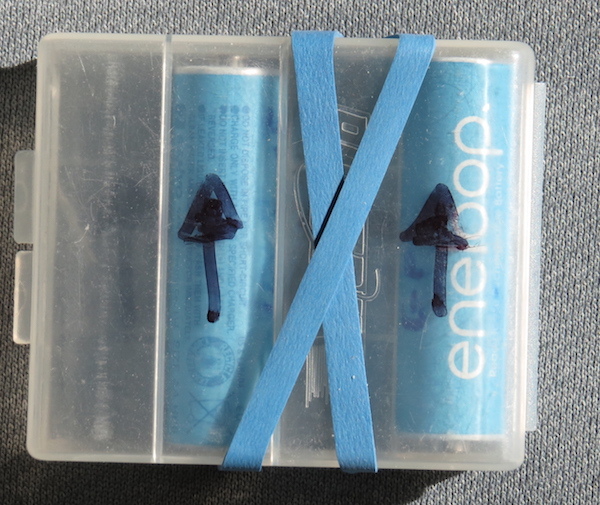 When I travel with the batteries, I use a rubber band around the case to avoid a mess if the case should be dropped. That way the batteries don’t go dancing across the floor. Good luck separating them at that point without using a meter. Rubber bands from broccoli in the supermarket produce department are ideal for this! If this isn’t “your style”, you can click the link to see how Nick Minore has found a different way to solve this problem.